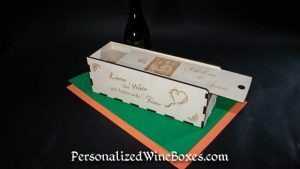 The presentation gift box that ages as a keepsake! 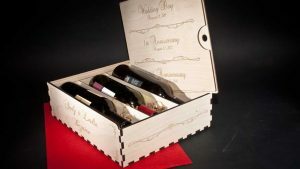 Don’t you just hate having to come up with a gift for an event you are attending, or a celebration that expects a gift. From a simple, non-thoughtful gift card to the navigation of a gift registry, deciding on a particular gift is often awkward and uncomfortable. And what to buy for someone who appears to have-it-all. We all have those “difficult-to-buy-for” people in our lives. 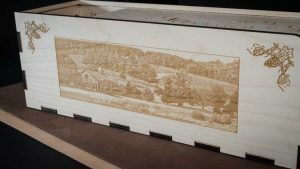 All our wine boxes are custom made from scratch from 1/4″ Baltic Birch plywood, they are not imported boxes. We can laser names, dates, poems, verses, graphics and photos (all with permission of course. The photos you provide will be photoshopped into a blended pencil sketch that lasers nicely. From business client thoughtfulness to simply appreciating a friend for no special reason – often times, unexpected gifting is the most appreciated. Express your thoughts with a tangible gift box. Wine or champagne is a traditional enjoyment of celebrations and good food. Don’t just arrive with a bottle in a bag or fancy bag. 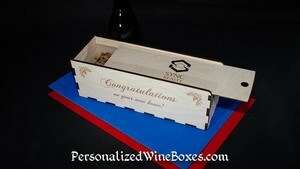 Make an stunning entry with your wine presented in our custom wine boxes. Decide on a wine or champagne that reflects some history, a particular year, a particular event within the year. And choose a label that is fun, suggestive, or appropriate.